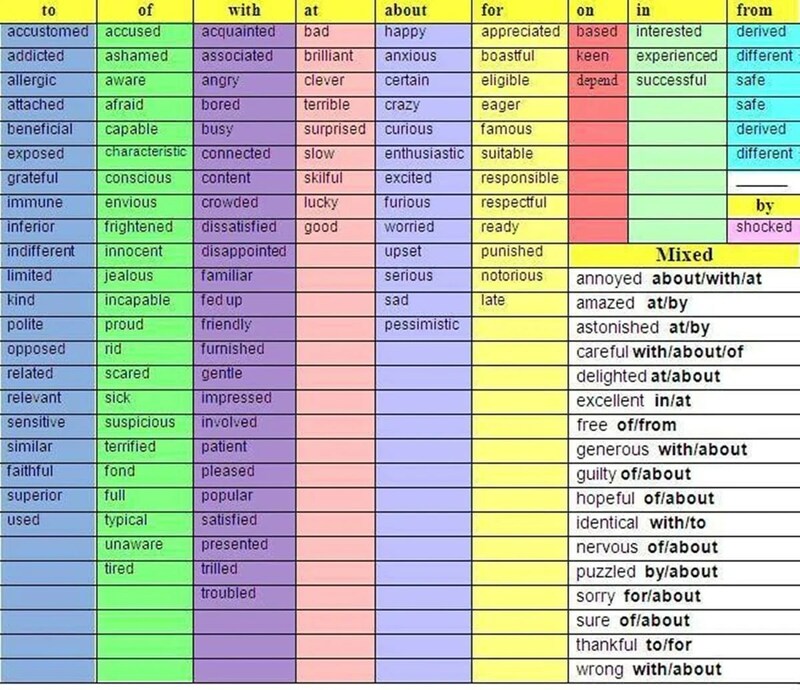 Prepositions and Adjectives – some adjectives are usually followed by prepositions. Are you acquainted with your classmate? I’m anxious to get home to open my presents. I don’t attach any importance/significance to these rumours. He made a careless remark about her appearance that really upset her. Charlie has a clever idea/plan for getting us out of our present difficulties. The floor was cluttered with my situation. Our program is coordinated with yours. I’m not crazy about Chinese food. The airport is crowded with stranded travelers. I can’t stand people who are cruel to animals. They were very curious about the people who lived upstairs. I’d be absolutely delighted to come. I am different from my brother. It is difficult for me to hear you. They were bitterly disappointed at the result of the game. She is eager for her parents’ approval. Only those over 70 are eligible for the special payment. They were envious of his success. They are excellent at planning fun parties. He’s excited about his birthday party next week. The country became highly exposed to the vagaries of international markets. He remained faithful to the ideals of the party.